A blog I haven’t read before has the extraordinary tail (sic) of the politicization of a senior citizen’s nightly congress with Man’s Best Friend. Is nothing sacred anymore? Chun-yi Lee posted here recently on the Taishang issue, Asia Times has a story on the same issue, with the added value of how China is trying to leverage its influence over Taiwanese business people in China: “if you can mobilize more votes for Ma, you will find doing business in China far easier in the future”. This is not at all surprising. More worrying is the Next report about attempts to “influence” local vote brokers. This is a very depressing development to go alongside the other means of CCP interference described here by Muyi Chou. This Taipei Times editorial concludes that ‘the CCP has apparently decided that its support for Ma no longer needs to be kept secret’. If you’re in the DC area, Brookings will convene an election panel made up of Richard Bush III, Shelley Rigger and Hsu Szu-chien on December 14th. 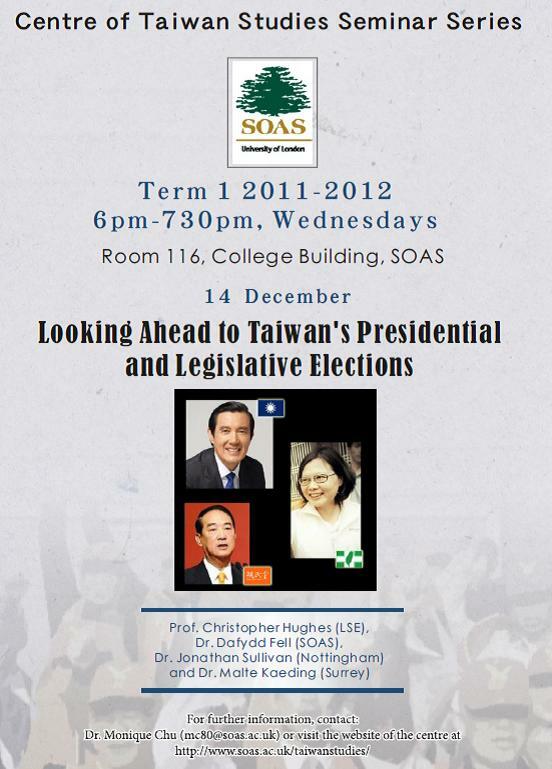 On the same day in London, SOAS will hold its own election panel, with Chris Hughes, Dafydd Fell, Malte Kaeding and me. I’ll post a report of any interesting goings on next week. 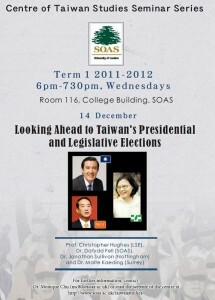 SOAS will also have a post-election panel on Feb 8th. I also want to draw your attention to the recently established Association Francophone d’Études Taïwanaises. It is currently being run by Jérôme Soldani (who posted here on Ma’s adoption of baseball) and Youan Goudin, who will also post here soon. It also has input from Stéphane Corcuff, who’s new book is highly recommended. This also seems an opportune moment to give a shout out to my friends at the North American Taiwan Studies Association (really looking forward to working with Murray Rubinstein and Shelley Rigger on a panel about the ‘decline of Taiwan studies’ at NATSA next year). And to remind you that proposals are now being accepted for the European Association of Taiwan Studies conference in Denmark, which will have at least one panel dedicated to the Taiwan 2012 elections.